Unless they participated in hot wars or qualified for the National Defense Service Medal, veterans of the Cold War received no official recognition from the US government. Kim Beck envisions a prosaic penny press—of the kind commonly used to create souvenirs at tourist attractions—allowing self-identified veterans to create individually specific medals, indicating their names, dates of service and type of service—even if that service is listed as "secret". 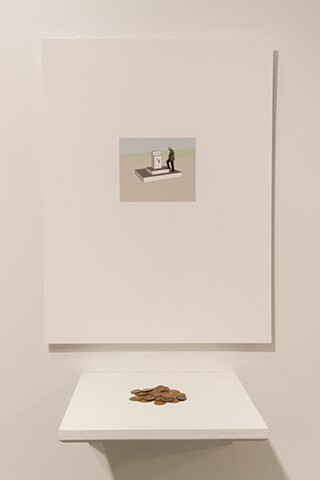 Actively embracing the established model of the “countermonument”—defined by scholar James Young in the 1990s to characterize an antiauthoritarian, ephemeral, interactive memorial practice—the Cold War Medal Machine requires the viewer to actively participate in its making. In the process of medal creation, viewers stand on a granite pedestal, taking the place of an archetypal cast-bronze figure in combat clothing. In stressing the process of self-identification, Beck acknowledges the global reach and myriad forms of citizen participation in the conflict, and leaves the commemorative process open to all roles and nationalities.